“The difference between good food and bad food is a pinch of salt.” Pierre Koffmann (and probably my favourite quote from this book). When I first began dating a chef (oh, hi there, husband), this was indeed the secret he taught me in the kitchen. Clearly, it’s the secret of many kitchens! September’s Cookbook Club pick from our home shelves is the brilliant Classic Koffmann: 50 years a Chef by the incomparable Pierre Koffmann. These recipes are indeed delicious, easy to follow, and contain simple ingredients. In the opening, Chef Koffmann recommends gathering ingredients for home cooking “everywhere, except for meat or fish; for these need a butcher or fishmonger you trust.” And we’d have to agree. Here in Norwich we have an array of brilliant local producers that are easy to find (nod to the Norwich Market! ), many that are family run and independent businesses who really know their stuff. Having these types of ingredients helps all of the recipes in this book truly shine. You can find 6 sections: 1) entrees (appetizers), 2) poultry, meat and game, 3) fish and seafood, 4) sides, 5) desserts, & 6) Chef’s Essentials. I think the chapter that gets the most use in our household is Chef’s essentials. There are lovely recipes for stocks, mayonnaise, vinaigrette, and beurre blanc alongside choux and puff pastry recipes that you know will work. This trust is an invaluable resource for the home cook ready to further experiment. Now, all you need to add is a pinch of salt. 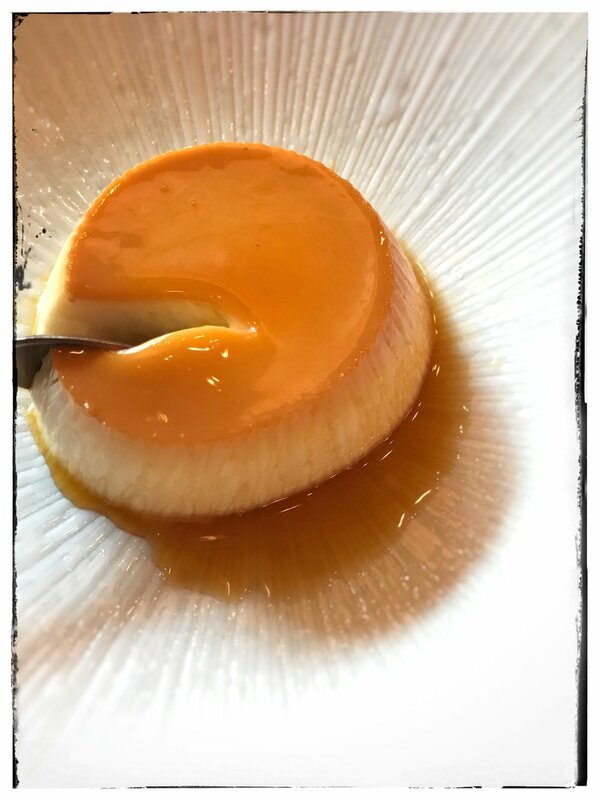 We’ve made Creme Caramel and highlighted the recipe below. It’s SO PERFECT you’ll never need another creme caramel recipe in your life. Don’t be scared of it: the satisfaction of watching the caramel slide out from the ramekin onto the plate is worth it. Line a large roasting tin with newspaper and place four 10cm ramekins inside the tin- the newspaper prevents bubbles from forming in the caramel. You need to start by making the caramel. Place the sugar and water in a large heavy-bottomed stainless-steel saucepan over a medium-high heat. Heat, until the caramel turns from a golden to a darker brown, then immediately remove from the heat and very carefully pour it into the bottom of the ramekins to create a layer about 3mm thick (you my have some left over caramel). Set aside at room temperature to cool and set. Heat the oven to 130*C.
Bring the milk to the boil with the vanilla pod and seeds, then remove it from the heat and remove the vanilla pod. Whisk the egg yolks, whole eggs and sugar in a bowl until thick, then pour the hot milk over this mixture, whisking constantly, until smooth. Pour the custard over the caramel in the ramekins, then pour some boiling water into the tin containing the ramekins so that it comes halfway up the sides of the ramekins. Transfer the tin to the oven and cook for 30 minutes, or until set- you can check this by inserting a small knife into the centre; if it comes out clean, the caramels are ready. Remove from the oven and leave to cool in the tin for about 20 minutes. To serve, simply turn each ramekin upside-down on to a plate- the caramels should slide out easily. nb from Chef Jaime: You can experiment with this recipe by infusing the milk with different flavors (than the vanilla) like herbs or teabags.